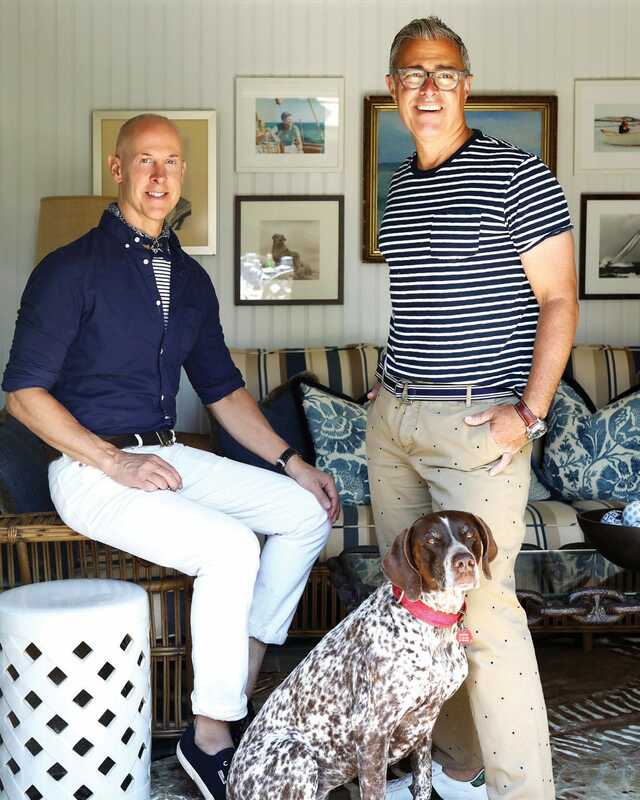 When an East Hampton couple—one an interior designer who loves sea glass and one a Francophile who owns a garden shop—decide to renovate a historic cottage, what’s inside will be just as fabulous as what’s outside. Michael Giannelli (right) and Greg Shano with their darling Harper. As a shop, East Hampton Gardens (easthamptongardens.com) is a physical manifestation of all the things swirling and swimming around in owner Michael Giannelli’s brain, including his impeccable taste. Much of that is due to his three decades as a fashion executive for companies such as Gap, Ann Taylor, The Children’s Place and Victoria’s Secret. His 1910 Cape Cod-style home, right down the road from the store, is a mirror reflection of his curated lifestyle shop, which is predominantly focused on his devotion to gardening and entertaining. “Those are two things I’m completely obsessed with: I love to entertain. I love to garden. I love to entertain in the garden!” quips Giannelli with his signature charm. 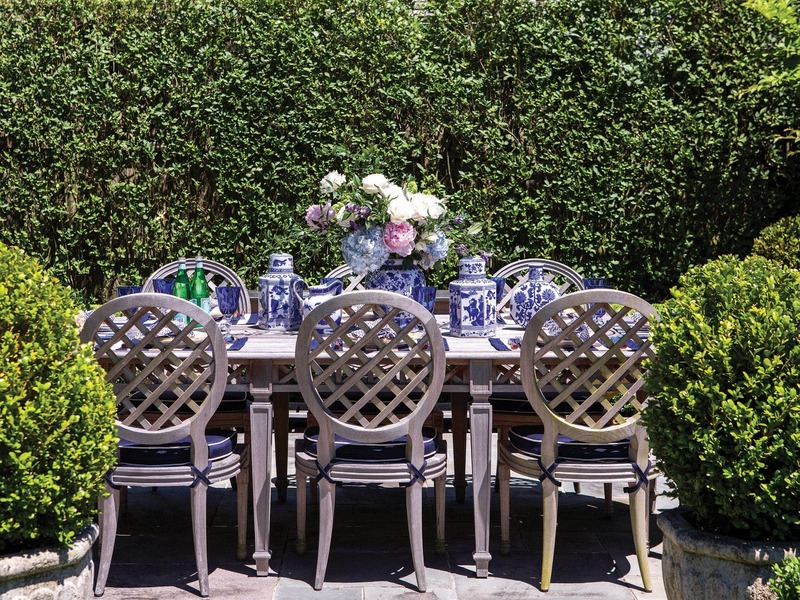 Flowers and table accessories from East Hampton Gardens grace a custom dining set from Accents of France. Adding to that good luck, the couple made it through the entire project without so much as a squabble. Given their respective design professions, the pair had made a pact: “He had final say inside the house, and I had final say on the outside,” Giannelli says. Shano also designed the interior of East Hampton Gardens. “When I wanted the shop to be all navy and white, he said that was not going to happen,” recalls Giannelli with a chuckle. “He decided it needed more of a personality and to speak more to a vision than simple nautical.” Since Shano is obsessed with beach glass and has an affinity for ocean colors, he brought those anchoring shades and motifs into their home interiors. Hence the teal front door and the seagrass wallpaper and light-blue baseboards in the main rooms. “The sunroom leading out to the porch is obviously our favorite space,” says Giannelli. There Shano mixed custom pieces with chunky jute rugs and off-white shiplap walls. The chartreuse ottomans and Giannelli’s large collection of vintage blue-and-white Chinese pottery from JED Design and Antiques help tie the bow on the sea glass feel. 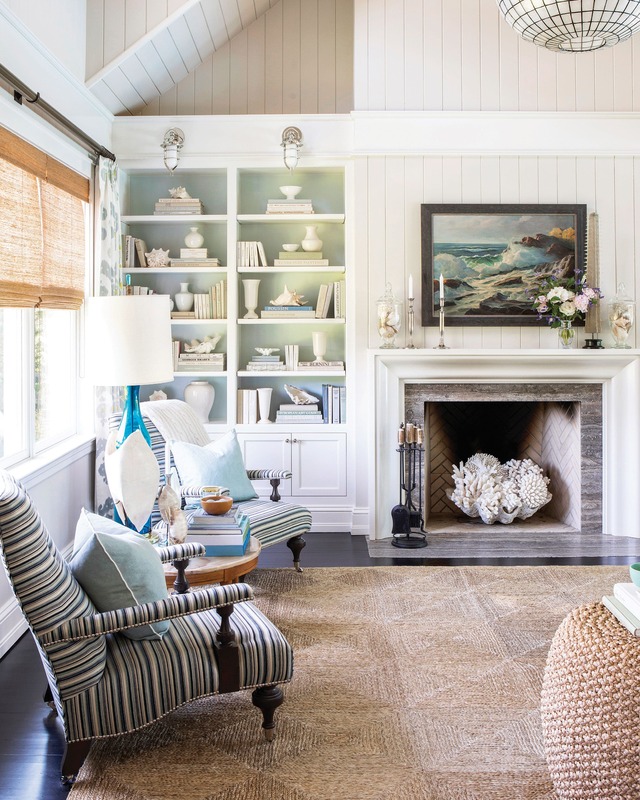 Items from the couple’s collection of vintage books, pottery and seascapes, as well as some tortoise shells from Bali, find their places in a sunny living room with a rug from ABC Carpet & Home. 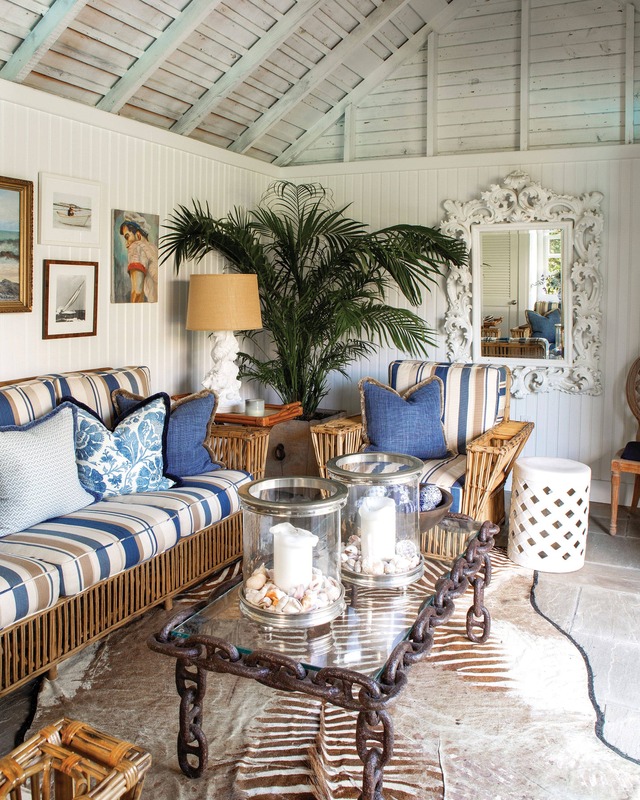 Gambrel’s influence can be seen in bookcases layered with garden and design books and off-white pottery, a collection of romantic seascapes on the wall, and the strong textures of rattan baskets in the sunroom. The living room has an eclectic mix of furnishings from different designers and eras, such as vintage demilune tables and French library chairs that Shano sourced from some of the couple’s favorite local shops, including Red Horse Market (redhorsemarket.com), JED (jeddesign.com), Ruby Beets (rubybeets.com) and Laurin Copen Antiques (laurincopenantiques.com). A mix of fun finds enlivens a seating area, featuring a vintage furniture set from Palm Beach, a table from East Hampton’s JED Design and Antiques, a mirror from Housing Works thrift shop and a vintage lamp from the Fontainebleau Hotel. “I’ll want to throw in an ornate Louis XIV mirror somewhere, and Greg will say no way,” kids Giannelli. “I am a huge Francophile, and he’s not. So I put a beautiful French fountain in the garden instead. That was our bargain.” Giannelli has always been influenced by Versailles and its landscapes, and he knew he wanted a formal French garden once construction wrapped. To help realize his vision, he partnered with talented landscape designer Hal Goldberg, who has since passed away; the couple’s backyard is now a memorial garden to him. Giannelli describes himself as a hobby gardener who grew up on Long Island and came to the beaches out East. “I fell in love with the farms and country life early on and moved out here to run the Gap in Bridgehampton Commons,” he says. “I was recruited by an executive to work in the corporate offices in Manhattan, and that started my fashion career.” That was 30 years ago. 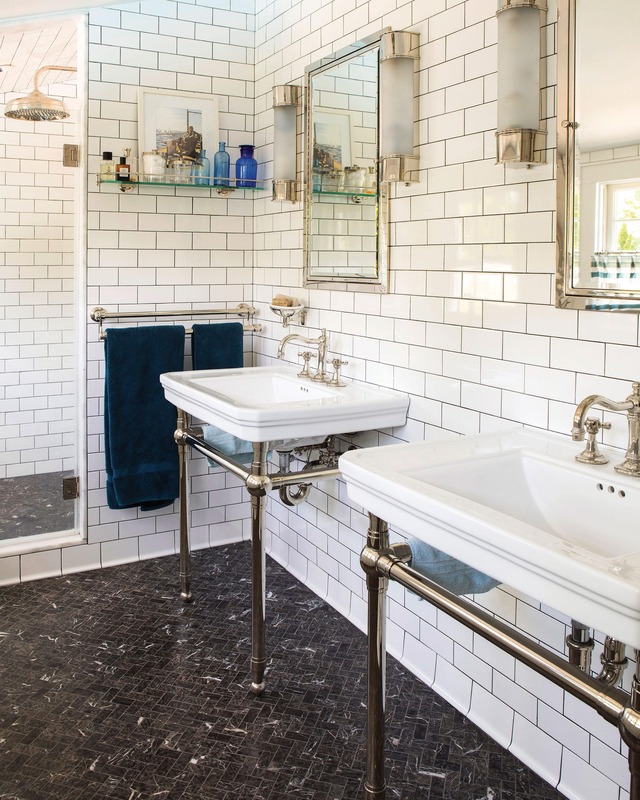 Custom herringbone marble flooring from Waterworks reflects sinks and mirrors from Restoration Hardware.